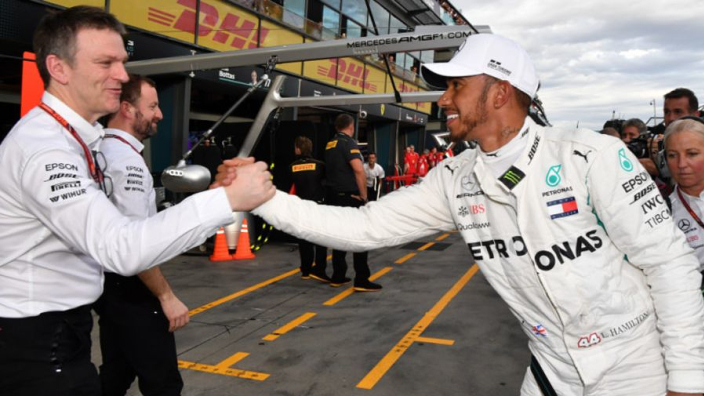 Mercedes technical chief James Allison has admitted that the Mexican Grand Prix on Sunday was a 'f*cking sh*t' day for the Silver Arrows, but still praised his team, and Lewis Hamilton, for their overall performance in the season as they lead the constructors' championship with two races remaining. Despite being dominated by Red Bull and Ferrari with Hamilton finishing in fourth and Valtteri Bottas in fifth, Hamilton earned enough points to win the drivers' championship at the expense of Sebastian Vettel, who finished second after needing to win to keep his title hopes alive. It may have been a forgettable weekend results-wise, but Allison looked back on the season overall with nothing but pride. “It was a f^cking sh*t day today, but this season as a whole has been a brilliant season," Allison told the Mercedes crew after the Mexican GP. “It’s not done yet, but this season as a whole is one that we are definitely going to remember all our lives. “Remember the fact that the competitiveness of this season has ebbed and flowed. There’s been times in the year where we didn’t have the best kit – but we kept coming back weekend after weekend, stretching the Championship apart." Allison singled out the newly-crowned five-time champion, Hamilton, for his integral part played in Mercedes' season. “Partly by what we did but mostly by what this guy [Hamilton] did. It’s been a year… where the driver played a bigger part than in many others," the Mercedes chief continued. Mercedes lead the constructors' championship by 55 points with two races remaining.